We found out today that the spongy-barked trees that grow around here are Melaleuca linariifolia, aka flaxleaf paperbark, and are native to Australia. It is a strange tree. Its fluffy canopy is composed of little lumpy segments, each of which blooms differentially from neighboring segments. The result of this, visually, is that sections of the tree periodically appear to have been replaced by large heads of cauliflower. Another interesting aspect of this tree is its bark, which is spongy, as previously suggested. 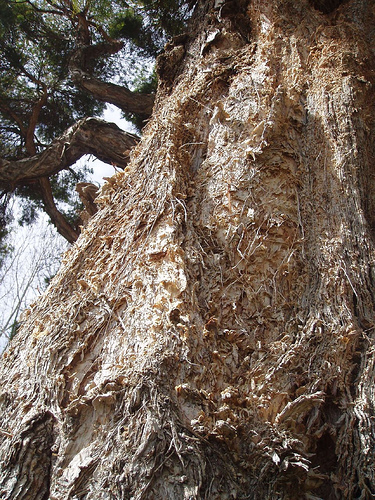 It is similar to the bark of a cork tree, except that the Melaleuca’s bark is made of layers of flakes. 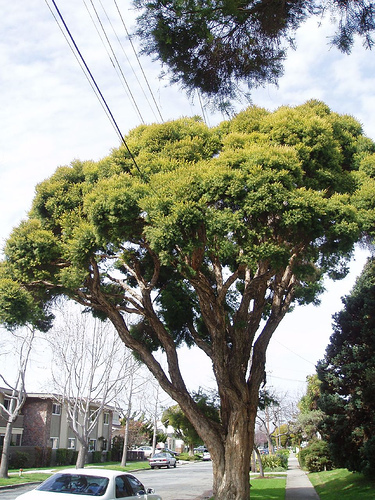 I think the Encyclopedia of Stanford Trees, Shrubs and Vines puts it best: the flaxleaf paperbark’s bark is “composed of sheets of thin ‘paper’ interleaved with thin sheets of a spongerubbery substance.” Some Stanford horticulture student has been reading Joyce. Our street has quite a few of these trees, and they bring us much joy with their spongerubberiness. They are now less of a mystery, but shall continue to be a curious tourist attraction. That must be why we get so many tourists. And blog readers. Right guys?